Immersing yourself in a boring lecture has always been difficult. The professor is discussing a challenging problem, and all you can think about is that comfortable bed you have at home. By the end of class, you’ve retained next to nothing and exams are right around the corner. Here’s where VR can change a mundane classroom to an interactive lesson that will help anyone learn and retain information quickly. To my Russian babushka, I explained it this way: Imagine you can go back to your home in Russia but be in Canada simply by putting on a headset. VR (Virtual Reality) allows an individual to be completely immersed in a virtual world and see everything, while remaining in the physical world. Not only can you see, you can hear and move around in the virtual world you’ve entered. My grandma couldn’t believe it, but it’s true. VR is also a key component of Industry 4.0, the fourth industrial revolution. You’re back in that boring lecture. The lecture was about the anatomy of an animal. Now imagine that instead of that boring lecture, you’re actually in a state of the art dissection lab surrounded by state of the art machinery, with panoramic windows atop a bright snowy mountain, you watch the anatomy floating mid-air inches from your face as your instructor tells you about the critical functions the endocrine system plays in anatomy. Sounds like the classroom of the future right? 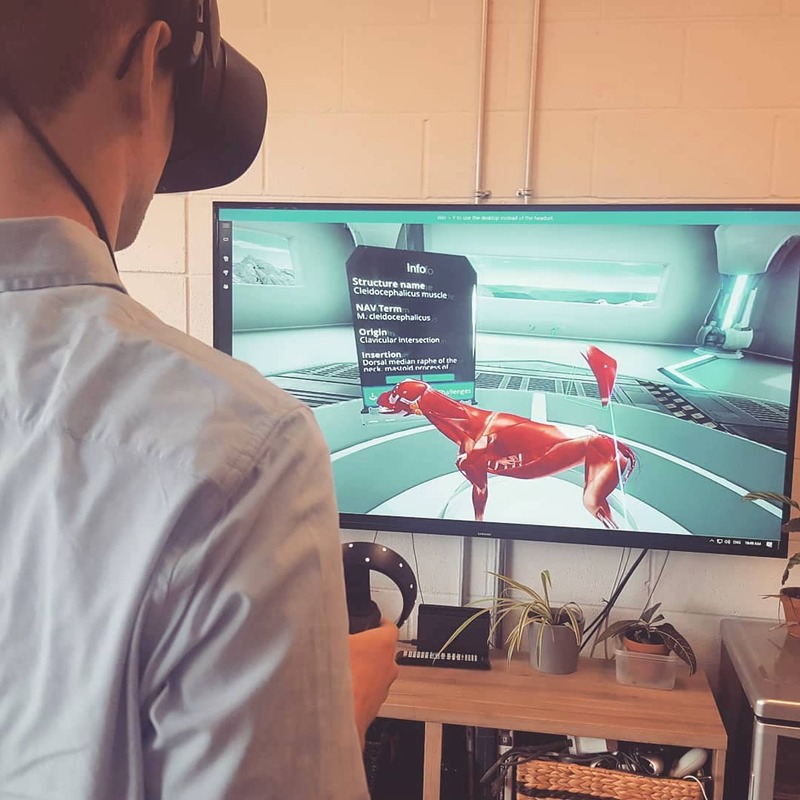 LlamaZOO has developed an interactive VR software solution called JetsonVR, which allows veterinary students to do just that, dissect a virtual dog using VR technology (don’t worry it’s not a real dog). What better way to understand the anatomy of a dog than by re-building one from scratch then with a virtual scalpel in each hand? In the book Virtual, Augmented, and Mixed Reality In Education researchers from Harvard found various reasons why VR can significantly improve student’s learning. Firstly, the book explains “guided social constructivist” theory. According to the author this theory is “The assumption that developing knowledge occurs best through building artifacts (physical or digital) that can be experienced and shared.” In simple terms, this theory explains that we are better at learning when we see and experience something we know. Therefore, when we see the anatomy of a dog in VR, we can understand it better based on our previous visual memory of a dog. Being present and able to hold each part of the animal’s body helps the human memory better than traditional audio or visual learning. The Harvard researchers have also found that Virtual reality allows an individual to stay consistent in their motivation to learn. Much of our learning in real life today leads to apathy, and then loss of interest. As most people know, students will learn the lesson, finish a test, and forget everything after. The researchers at Harvard have found that in contrast to conventional practice, students will experience higher motivation from VR. As described by social constructivist theory, scientists found that immersion allows students to learn practically. In part, its due to the visual aspect, but mostly because of the movement and the actual physical gestures permitting the students to remember information better. Humans are naturally designed to learn through a combination of movement, visual, and auditory experiences. Combining all three elements will grant us the ability to retain knowledge quickly and for a long time. As the statistics above show, anything we see and hear will already increase our retention by 50%. If we combine that with engaging the learning through immersive and interactive tech (such as VR), we will grow our learning capability by 90%! This research from Harvard only sustains our hypothesis that Virtual Reality will reshape how we will learn. Teachers in primary, secondary, and postsecondary education will be able to apply this tool into their classroom. In fact, it’s already being done as educators are now applying Virtual Reality in all sorts of fields. At Georgia State University, for example, instructors are using VR to project art history onto the Google Cardboard and Samsung Gear VR. No longer will it be just a slogan that “learning is fun!” Well unless you already love learning. This returns back to Industry 4.0. With a new digital ecosystem ahead of us we should prepare for this future of technology. Industry 4.0 will help us reevaluate how we manage all sorts of industries, from education to automation. Allowing industries to thrive by working in co-partnership with technology will increase productivity and accuracy. Therefore, it is gravely important for humans to drastically reassess how we see all of our conventional practices in our regular lives. LlamaZOO is a leading technology company specializing in 3D visualization in VR/AR. The ZOO has already developed software to train veterinary students using VR software. LlamaZOO is changing the way humans interact and communicate with information, from education to enterprise. From supporting students learning complicated 3D subjects like anatomy, to helping forestry and mining companies make better decisions by bringing their data to life – VR has become a turning point for industry leaders. VR is an exceptional tool and we are excited to see its future progress in this age of rapid technological development.